What started as a father-son visit to the John Deere Pavilion, marked a milestone and uncovered a family’s deep connection to the John Deere brand. Kurt Snow (left) was the John Deere Pavilion’s four millionth visitor. He was joined by his son, Drake. Over the course of its 20-year history, the John Deere Pavilion in Moline, Illinois, has become a special destination for many. They come not just to see the big machines and innovative products that have impacted so many lives. They come because of their fondness for the company, its history and the role it’s played in their lives, which goes beyond that of a typical customer-business relationship. 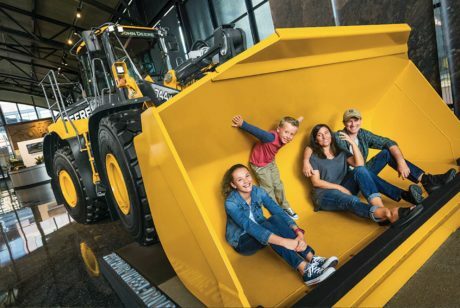 The Pavilion has been a destination for Make-a-Wish families and for those who want to memorialize loved ones who held an affinity for John Deere. It’s been a stop for wedding parties to take pictures with Deere’s iconic machines. One family even traveled all the way to Moline from Africa because the Pavilion was their 12-year-old son’s dream vacation. “He could have chosen Disney or New York City, but he didn’t. He chose to visit Moline to see the John Deere Pavilion,” said Brigitte Tapscott, manager – John Deere Attractions. 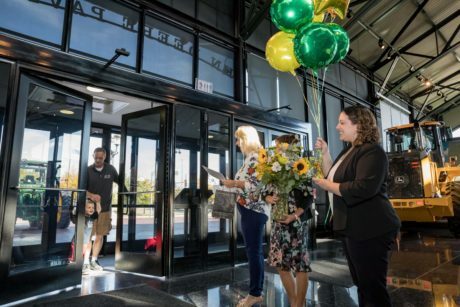 And that’s why Deere opened the 14,000-square-foot glass and steel structure 21 years ago, said Mara Downing, director of Brand Management, to recognize the special relationship Deere has with customers from all over the globe. 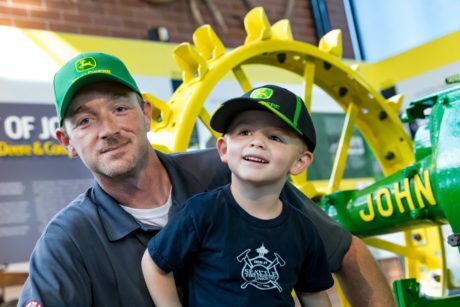 Many families have built their vacations around visits to the John Deere Pavilion. When Kurt Snow made the last-minute decision to stop by the Pavilion in October, he was looking to entertain his 3-year-old son, Drake, not mark a milestone. But that’s what the two Streator, Illinois, residents did when they walked through the Pavilion’s front doors. Snow was the pavilion’s four millionth visitor and the pavilion staff greeted him and his son with flowers and balloons. As the stars of the day, Kurt and Drake were congratulated by Pavilion staff and posed for several photos. They also received a $400 gift certificate for the John Deere Store next door. Brigitte Tapscott, manager of the John Deere Attractions, said they’ve been tracking visitor entry to the Pavilion ever since it opened in 1997. Pavilion staff greeted Kurt Snow and his son, Drake, with flowers and balloons. With the four-million visitor mark approaching, they were eager to celebrate the accomplishment and shine attention on an attraction that is a very popular tourist destination, averaging 180,000 to 210,000 visitors per year from all over the world. Serving as a centerpiece for Moline’s John Deere Commons, the Pavilion was part of a downtown revitalization project when it was built in 1997. The facility was designed to celebrate the company’s history, its modern equipment (some of which is on display), and John Deere’s role in contributing to mankind’s future, specifically building the machines that feed our growing global population. Tapscott said they see every type of John Deere fan at the Pavilion from children on field trips to seniors on bus tours. Many families can also be found there on weekends, taking advantage of the free admission and giving little ones a chance to play while also learning. Tapscott said the staff, which includes several Deere retirees serving as tour guides, are great at being able to share stories and details that engage guests regardless of how familiar they are with the company and our products. 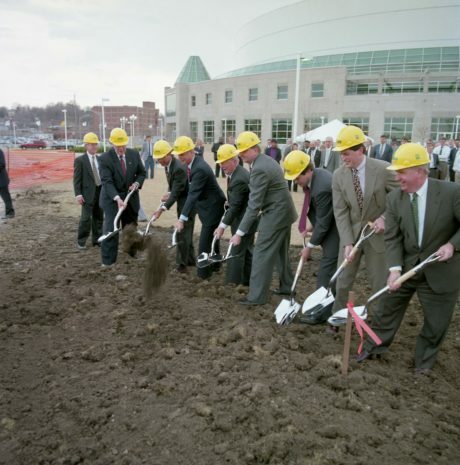 Civic leaders in the Illinois-Iowa region break ground on the John Deere Pavilion in 1996. And if you haven’t visited the John Deere Pavilion recently, there is a good chance you will find something new. Some of the current Deere products on display include an 843L Feller Buncher (used in logging), a 560M Round Baler, an S770 Harvester, and a Gator. On the much smaller end there is the TANGO, an autonomous mower, which busily simulates mowing a lawn. One of the next projects will be updating the Pavilion’s “Our Growing Planet” exhibit, which examines the big challenges that come with a growing global population and showcases ways John Deere is working to help address these issues. The exhibit is scheduled for completion in 2019. A few weeks after becoming the Pavilion’s four millionth visitor, Snow returned with his family so they, too, could see the exhibits. “I always wanted to bring all the kids,” he said. 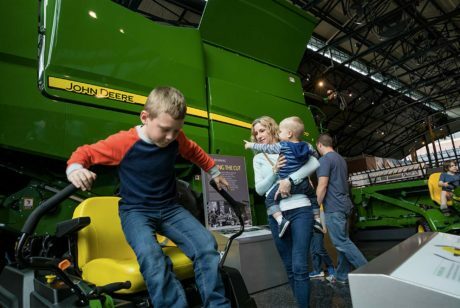 John Deere fans of all ages will find a variety of exhibits and equipment to explore. Snow also brought his 91-year-old grandfather, Norris Snow, who had never visited the Pavilion before. Norris worked at a John Deere dealership for 13 years and has restored four John Deere tractors, including his father’s (Kurt Snow’s great grandpa) 1941 Model B. Norris and his sons even drove the tractors in this year’s Fourth of July parade in Streator. “Grandpa pulled a wagon with all the kids and grandkids in it,” Kurt Snow said of the parade. The John Deere Pavilion is open Monday through Saturday from 9 a.m. to 5 p.m. and on Sundays from noon to 4 p.m. For more information, visit the Pavilion’s website below.